All some want for Christmas is their two front teeth – but spare a thought for whoever managed to flush their posh dentures down the toilet. Wessex Water wants to trace the owner of a set of false teeth – complete with a gold tooth reminiscent of Joe Pesci’s “wet bandits” character Harry in the Christmas classic Home Alone – which were found at the firm’s water recycling centre in Bristol. Wessex Water’s Matt Wheeldon said: “The false teeth ended up at our water recycling centre after being flushed down the loo and making their way through Bristol’s sewer network. 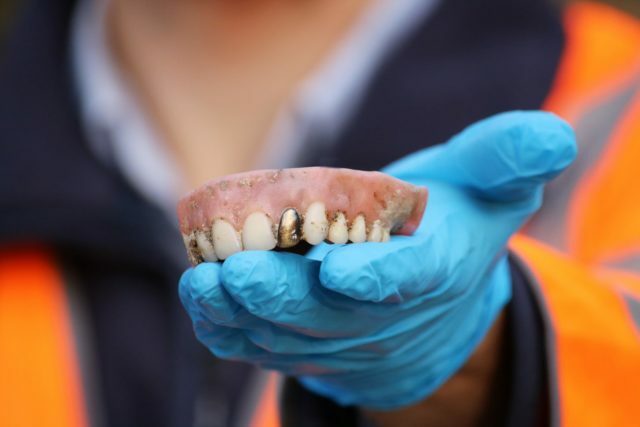 “We’ve found dentures at our treatment works before but never with a gold tooth attached – perhaps it has sentimental value to the unfortunate owner, so we’ll happily clean and return them. “People would be amazed what gets fished out of the sewers, from children’s toys to mobile phones, and this often raises a chuckle among our staff. A significant proportion of these are caused by wet wipes, even though some of them are branded and marketed as “flushable”. Mr Wheeldon added: “We would like to remind everyone to only ever flush the three Ps – paper, poo and pee – to ensure you don’t face a nasty blockage in your drains.